Groupe Renault has announced a program where it will show how re-employing second-life batteries can support a local "smart island" ecosystem. The announcement translates to an automaker and a utility company transforming an island into what edie.net referred to as a "Smart Fossil Free Island" that treats electric vehicles as aids to renewable energy. 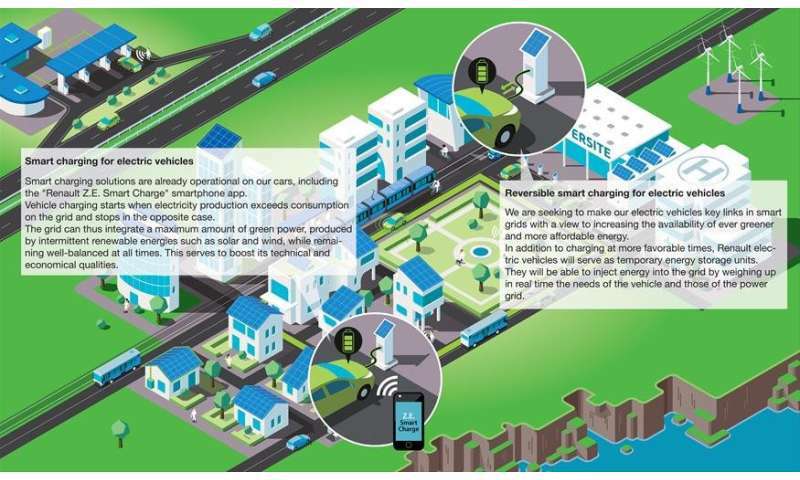 EVs and battery storage are key features in this 'smart island' project. "Our aim is to build a model that can be carried over to other islands, eco-districts and cities, said Eric Feunteun, Electric Vehicles and New Business Program Director at Renault. Kyle Hyatt, News and Features Editor, Roadshow, similarly wrote, "We'd love to see this trial succeed and be rolled out at scale to other municipalities around the world, particularly those in economically challenged areas where other larger-scale investment might not be financially attractive to companies." Renault announced the island of Porto Santo, a small Portuguese island, is getting a pilot program by Renault, teaming up with EEM (Empresa de Electricitade da Madeira) and the Madeira Regional Government. EEM produces and sells electricity on the Portuguese islands of Madeira and Porto Santo. EEM chose Groupe Renault as partner for electric mobility solutions. Cars will serve as temporary energy storage units, weighing needs of the vehicles and needs of the grid. Later this year, said Kyle Hyatt, News and Features Editor, Roadshow, the cars as energy storing devices will be used "to provide energy back to the grid during times of peak consumption, essentially serving as big, wheeled backup batteries that will stabilize the whole system." The potential can be better power consistency to benefit the island's residents, via a smart electric ecosystem that includes new cars, stored energy and second-life batteries. The batteries from Renault EVs will be used to store renewable energy produced by the island's solar and wind farms, said edie.net. "As electric vehicles (EVs) continue to enter the market in increasing numbers, their batteries can be utilized for other purposes when not powering the vehicle. The batteries used in EVs typically last about 8-10 years when used for propulsion, yet these batteries still have significant capacity remaining for alternative uses. Finding secondary uses for the EV batteries reduces their up-front cost and provides benefits to consumers and utilities, such as demand charge management, renewable energy integration and regulation energy management." What's in the fleet: 14 Renault Zoe EVs and six Kangoo electric vans. "Renault will provide vehicles to 20 volunteers and work with the Madeira archipelago power authority (EEM ) to install 40 public and private charging stations on the island," said Hyatt. This is how the project will be deployed. Renault Groupe described it in three phases. "Firstly, 20 volunteer users in Porto Santo will drive 14 ZOEs and six Kangoo Z.E.s for their everyday use. These vehicles will be able to benefit from smart charging thanks to the 40 connected public and private charging points set up by EEM and Renault on the island. Secondly, by the end of 2018, the vehicles will step up their interaction with the grid by providing it with electricity during peak hours. In addition to being smart charged, the electric vehicles will therefore also serve as temporary energy storage units. Thirdly, second-life batteries from Renault electric vehicles will be used to store the fluctuating supply of energy produced by Porto Santo's solar and wind farms. Stored as soon as it is produced, this energy is recovered by the grid as and when needed to meet local demand." Matt Mace, edie.net, commented, "Islands are becoming ideal testing grounds for companies to integrate energy storage techniques."